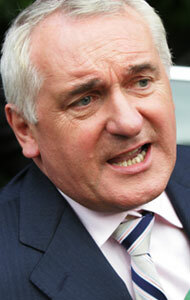 TAOISEACH Bertie Ahern should resign because he has presided over ten years of inequality and the poor health service, not because of ‘dig-outs’ from wealthy friends, Sinn Féin Dáil leader Caoimhghín Ó Caoláin TD said this week. The Cavan/Monaghan TD was responding to calls by the leaders of Labour and Fine Gael for the resignation of Bertie Ahern over the ongoing Mahon Tribunal probe at Dublin Castle into his financial affairs. Speaking on Monday, Ó Caoláin said that while the Taoiseach’s “financial woes” are indeed serious, “they are minuscule in comparison to the deep inequality in Irish society Bertie Ahern has fostered since 1997”. All of our public services are in disarray due to years of minimal investment in the necessary critical infrastructure by successive Fianna Fáil-led governments, Deputy Ó Caoláin said. And Ó Caoláin saved his most strident criticism for Ahern’s overall responsibility for the decline of the health service.